This historic inn is a great home base to enjoy the ultimate Pennsylvania road trip! Just 45 miles from Gettysburg, within 20 miles of Lancaster City, Hershey, York, Harrisburg, and Pennsylvania Dutch Country. Plenty of activities along the Susquehanna River, (a half mile walk from our front door) like kayaking, canoeing, fishing, and hiking. Lancaster PA, Hershey, the Historic River Towns of Marietta, Columbia and Wrightsville are just a short drive from B.F. Heistand House bed and breakfast, Enjoy historic Pennsylvania Dutch Country, wineries, Lancaster shopping outlets, and many other Pennsylvania attractions and sights. 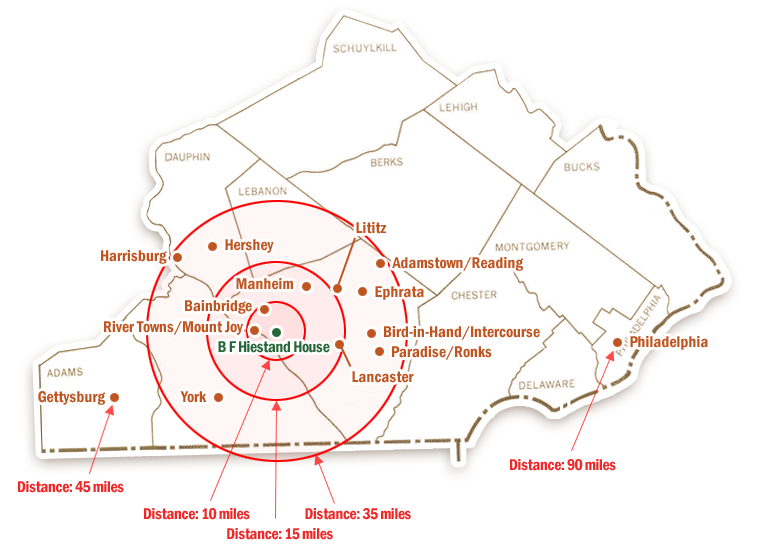 We are also central to York and Harrisburg. Maybe you are interested in a quiet couple of days away from the rush and noise of everyday living... this lovely Victorian B&B is the place for that too. Please ask us for specific suggestions. The current owners, innkeepers and your hosts, Pam and Dallas Fritz, will do everything possible to make your stay enjoyable, so that you will also want to become one of a growing number of repeat visitors to this wonderful, smartly appointed inn and retreat. Our uniquely styled rooms are designed with your ultimate comfort in mind. Each has a lovely private bath, premium linens, free WIFI and many other creature comforts. Relax, unwind and wake refreshed. Make your stay even more special by selecting one of our suggested packages or add-ons when booking online. Have something else in mind? Call us at (717)426-8415 to help you customize a package that is right for your special occasion. Get all the latest information about everything to see and do around Lancaster, York, and Hershey. We offer descriptions, directions, and contact information on many local activities and attractions. We make it easy to explore.